Tapas are Spain’s greatest food invention. “Eat when you drink, drink when you eat” is the philosophy. They are not meant to be a meal (although a ración is a substantial portion.) One tapa per person and a different one with each drink is the idea, then everyone enjoys tasting and sharing. Just make ahead and reheat.. serve with a good Spanish red wine, some nuts and marinated olives. Weather you are a serious foodie, or just want to explore the ingredients in Spanish cooking – this recipe is for you! I love creating them at home with authentic ingredients. 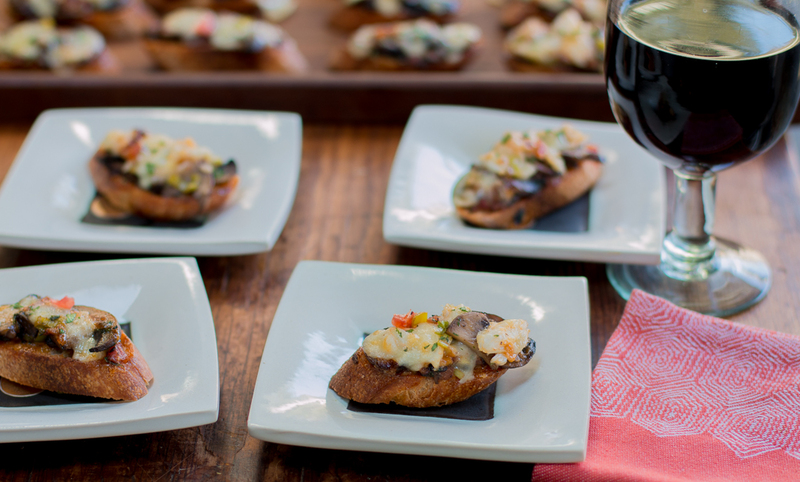 Popular throughout Spain, tapas are festive and delicious appetizers and snacks that are perfect for get-togethers or dinner parties. 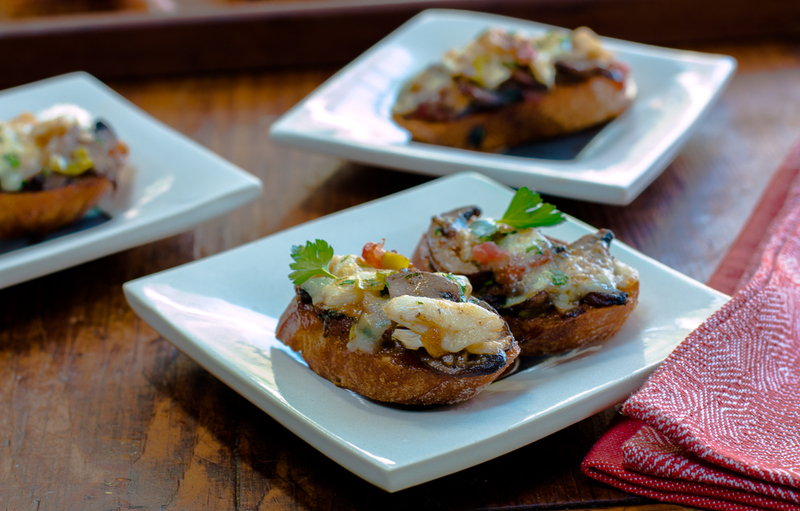 Cremini Mushrooms (baby bellas) have a hearty, earthy flavor and absorb many flavors beautifully – they are the base for the recipe. 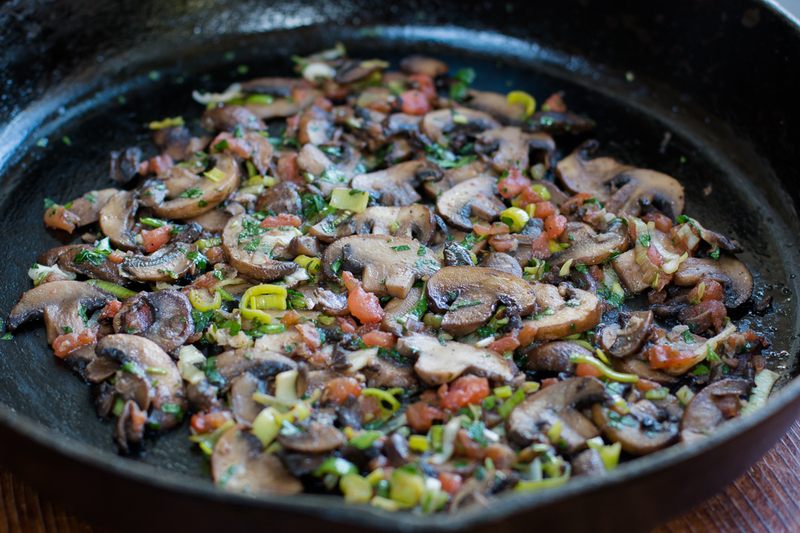 Sauté them, adding leeks, tomato, garlic, salt & pepper – add a dose of dry sherry and brandy and stir. Pretty easy. 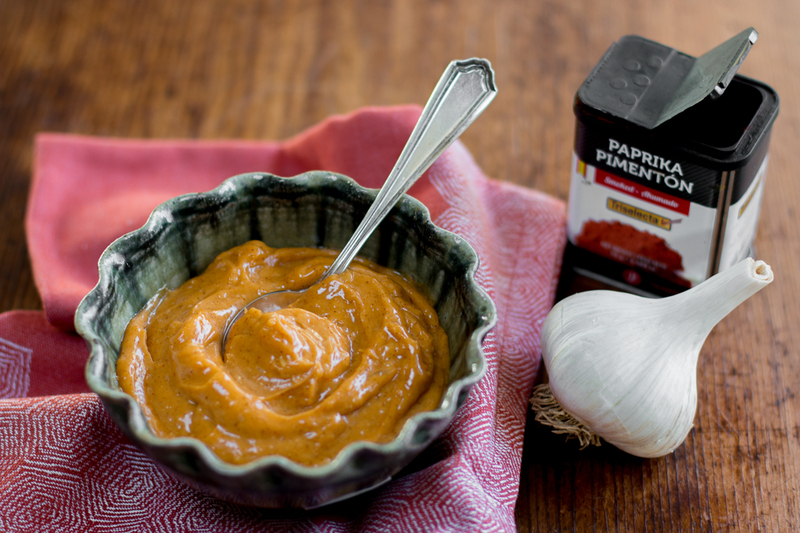 Make the “flavor bomb” for the tapas – Smoked Paprika Aioli, which is a very flavorful garlicky mayonnaise spiked with Spanish Paprika and a squeeze of lemon juice. It is not difficult to make, I whisk it by hand with in a stainless bowl and a balloon whisk. Yes… I’ll give you a cheat recipe which will work ok – see recipe. 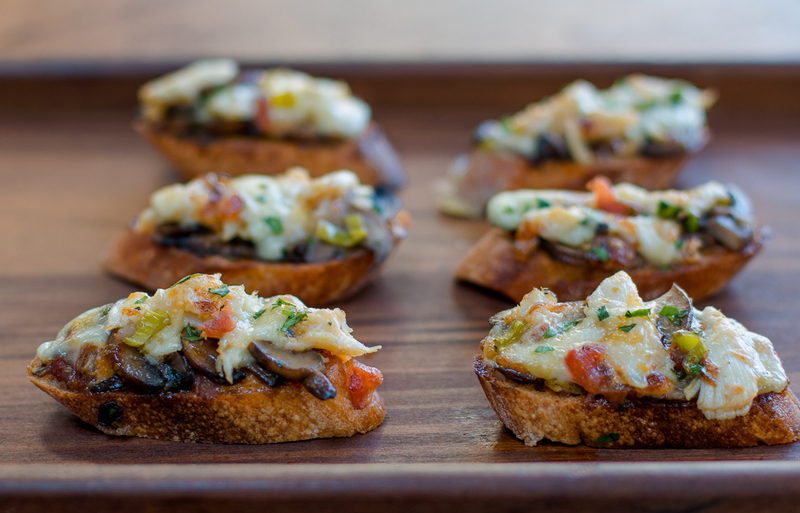 Toast some baguette slices, I used a sourdough variety – smear with a little Smoked Paprika Aioli – top with the Mushroom Sauté then some little slices of Spanish Mahón Cheese. Have you ever tried this amazing cheese? It’s popular, and available at most better gourmet and specialty cheese shops – it is soft to hard cheese with buttery, sharp, salty in taste, with a sweet and nutty aroma. Its rind is rubbed with Spanish paprika. And – it melts beautifully!! 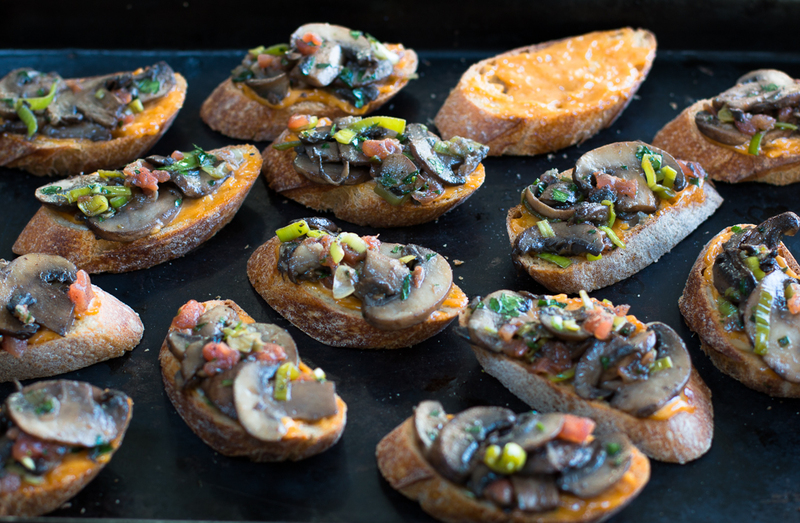 Then, set the tapas on a tray and broil until the cheese is melted and bubbly. Serve immediately. 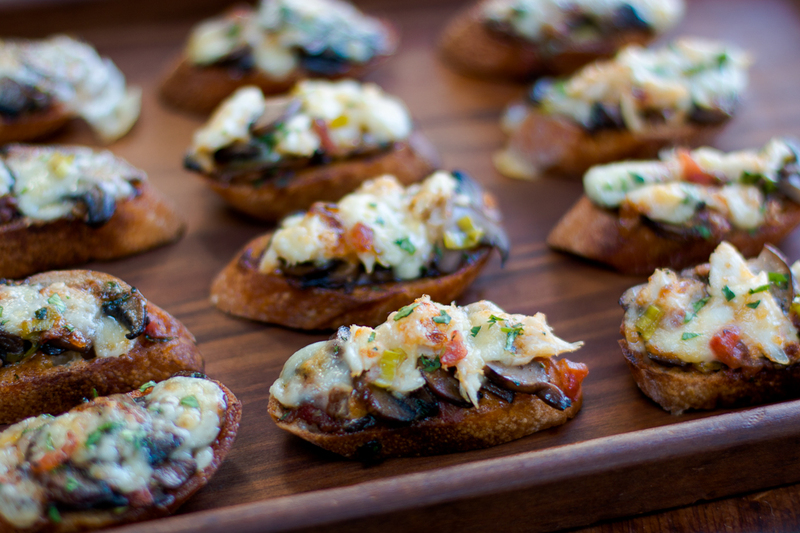 They may be made early in the day, add cheese and broil as your guests arrive. There are several legends about the origin of tapas. One of them refers to the origin of the word stem “tapa,” which literally means lid, and comes from “tapar”(cover). In the Andalusian taverns, the guests used bread or cheese slices as a cover for their sherry glasses to protect the precious contents from flies and other insects. This then supposedly developed into the small appetizers. 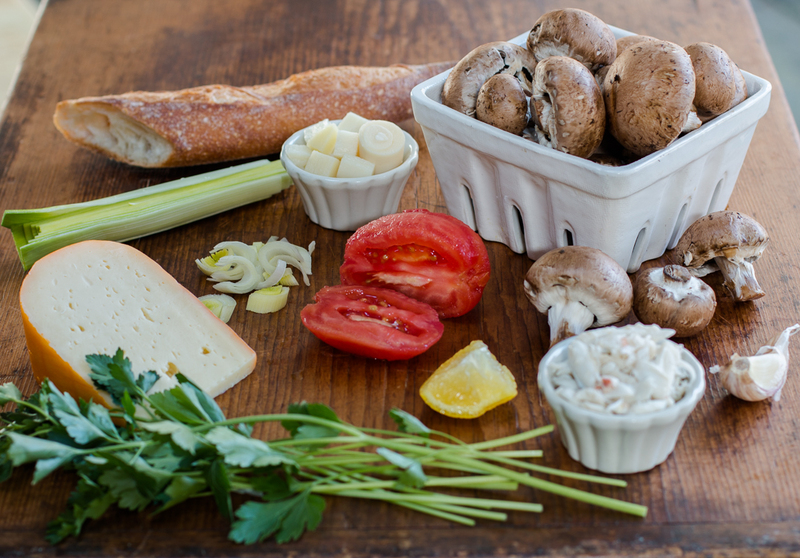 Ingredients for the Smoked Paprika Aioli – a flavorful, garlicky mayonnaise… see recipe!